March 21, 2016 – A University of Colorado Boulder student team has advanced in a competition to design and build a flight-qualified small satellite capable of operating near and beyond the moon, earning the team $30,000 from NASA and a chance to have it launch into space. As one of the top five teams selected by NASA, the CU-Boulder team will continue developing a small CubeSat satellite about the size of a shoebox called the CU Earth Escape Explorer (CU-E3). Part of the Aerospace Engineering Science Graduate Projects Class, the satellite is being designed to fly on the unmanned Orion Exploration Mission-1 (EM-1) slated to launch in 2018. Lockheed Martin Space Systems of Littleton, Colorado is the prime contractor for the Orion Multipurpose Crew Vehicle on which the winning satellites will ride. The CU-E3 satellite is part of the NASA CubeQuest Challenge Deep Space Derby, a project focused on finding innovative solutions to deep space communications using small spacecraft. Northrup-Grumman, headquartered in Falls Church, Virginia, provided $10,000 to support the project in 2015-2016. The satellite is being designed for a communications mission that will travel more than 2.5 million miles into space and a chance at winning another $1.5 million from NASA. “The Aerospace Engineering Sciences Graduate Project course allows us to engage students from disciplines across the the College of Engineering and Applied Science in exciting, real-world hands-on projects,” said CU-Boulder Professor Scott Palo, who teaches the graduate class building the CU-E3 satellite. Blue Canyon Technologies (BCT), a rapidly growing small satellite company founded by CU-Boulder alumni, is partnering with the CU-E3 team. A satellite body, or bus called XB1 provided by BCT will point the satellite accurately, interpret commands and manage power for the CU-E3 payload, said Palo. Three CubeSats that previously were developed in the graduate course have launched or will launch into orbit, said Palo. One operated in orbit for 28 months, the second was launched to the Internal Space Station in December 2015 for deployment into space in April and the third is slated to launch in 2017. 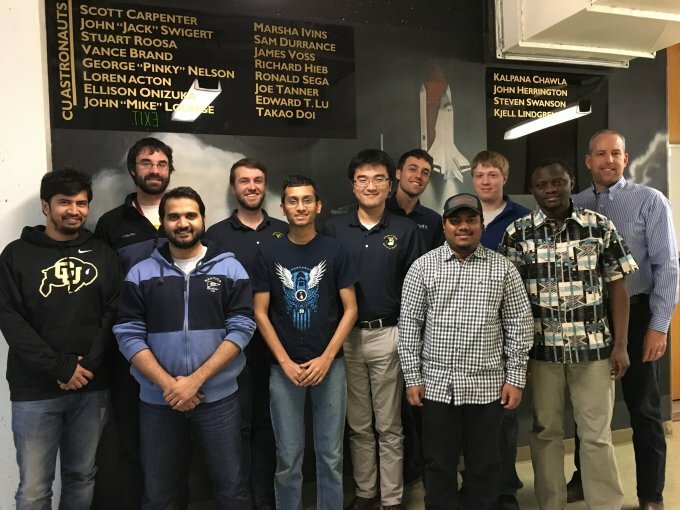 The CU-Boulder graduate students working on the small satellite are Abhinav Pandey, Alec Herr, Varun Joshi, Thomas Green, Anirudh Rajaseshan, Huikang Ma, Maurice Woods, Maheedhara Reddy, Alec Forsman and Elie Tianang. “The CubeSat projects are great for those who want to learn about small satellite development and have the experience of designing, building and testing hardware that will fly in Space,” said Palo. The CU-E3 satellite will reach an orbit of about 10 times the distance between Earth and the moon.